I would like to take this opportunity to say a big Thank You to Eoghan Murray of F/1.0 Camera Repair for breathing new life back into my camera , Canon EOS 6d and preparing it for more adventures at the shoreline. My camera has served me well for over 3 years now. It has got splashed by waves many times ( along with its owner ).. and has been exposed to the sea air practically every day for the past 38 months. However , it gave up the ghost last weekend at Hook after an encounter with a wave.. I didn’t think much of it as I had turned my back in time as the wave hit me. It did get a little wet, but no more than usual. However within 10 minutes it started to malfunction and I was unable to get it right again. The 6d is weather-sealed, but the weather sealing will not protect against large amount of water , esp salt water which corrodes regardless of the seal and thus reducing the sealing over time too. I contacted Eoghan first thing the following morning after I had let it dry out overnight , and it was still not working properly. As always, he was very helpful and obliging and let me drop it in to him on Sunday afternoon on my way home from Wexford . 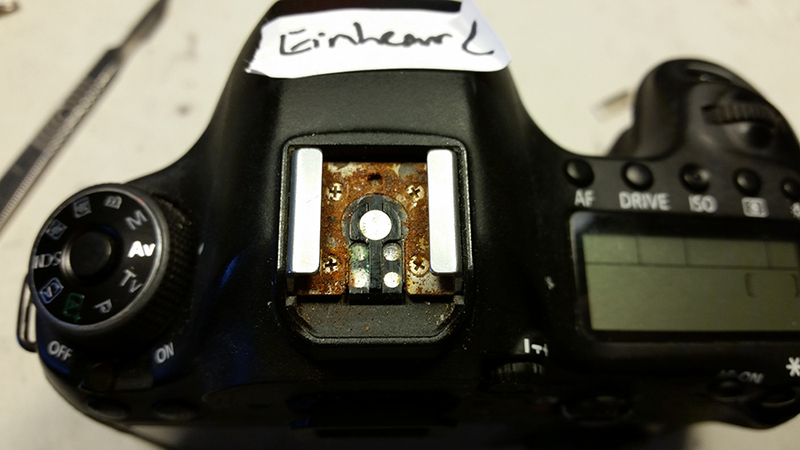 You can get an idea of the extent of the damage to the camera by looking at the image.. You might be able to make out the rust on the hot shoe ( which has now been replaced).. I cannot thank Eoghan enough for doing such an excellent job , as always . Eoghan is a pleasure to deal with , very obliging and takes the time to give me a detailed report of the issues and even shows me images of the work in progress . And the best part is that I had the camera back in my hands again by noon today and at a very reasonable cost . An excellent service and I cannot recommend Eoghan highly enough. Needless to say the camera will be returning to the shoreline very soon and will be exposed again to the sea air which will cause further corrosion. Bearing this in mind I will be returning to Eoghan every 6 months or so to deal with this issue, as leaving it unattended will destroy the camera. Warning : Great care must be taken when doing seascapes especially during high tides and stormy weather. No image is worth the risk of putting your life in danger. Thanks you for that report Eimhear, it’s good to hear all is rectified . It’s good advice to all doing seascape photography, I will bear that in mind!. If ever I encounter trouble with my cameras I will contact Eoghan :-). Stay safe! many thanks for that Ann .. much appreciated. I cannot recommend Eoghan highly enough and if you do have issues , you can get your camera to him via courier rather than travel up to Delgany !